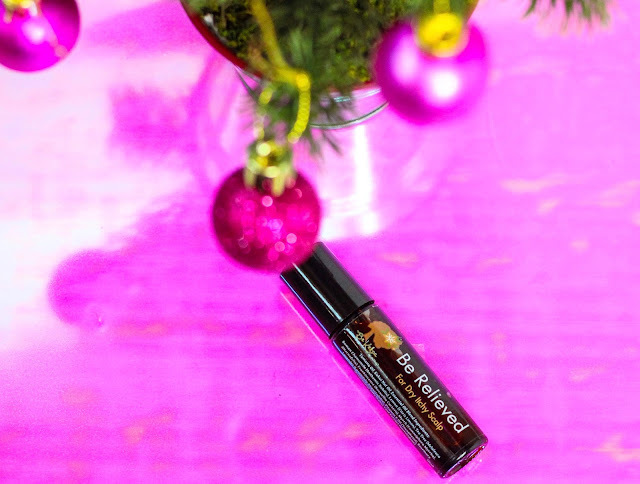 Look what santa put under the tree - scalp relief! Got dry, itchy scalp that flakes and makes it really difficult to wear protective styles - and forces you to wash your hair at least twice a week? While the conditions that cause scalp issues can range from dandruff and psoriasis to imbalances caused by medications and medical conditions, one thing rings true across the board - no matter the cause, the effect is suuuuuper annoying. I'd love nothing more than to toss my hair into some faux locs and forget about it - but scalp psoriasis won't let me be great. And even though I cleanse my hair and scalp twice per week, I still have to contend with itching and dryness between washes - especially around my hairline, and in that front/center patch. For us with natural hair, daily washing (especially with medicated shampoos) is not only impractical, but puts too much stress and manipulation on our textured curls. What's a naturalista to do? Don't stress it - I've got 5 solutions that will help calm your scalp, soothe itching, alleviate dryness, and at the same time, stimulate growth. Note: Before proceeding with the solutions below, please rule out a lack of shampooing as the source cause of your scalp woes. If your scalp is itching, flaking, dry,and tight, but your hair hasn't seen shampoo in 6 weeks - handle that, sis. You need shampoo more than targeted scalp solutions. Also, if you are experiencing flaking that's yellow and waxy or thick and scaly, please see a dermatologist to receive a proper diagnosis first. I'm not a licensed medical professional, and nothing shared in this post (or on maneobjective.com) is to be taken as medical advice. Now that we've got that out the way, keep reading to learn more about each one! P.S. - They're ALL Black owned. Creating solutions for us, by us. During my most recent trip to Temecula, Brandie revealed that she's been a busy bee behind the scenes at Be Kekoa. Aside from another major economic empowerment initiative, she's developed three whole new products! I'll get into the other 2 another time, but the one I want to focus on right now is Be Relieved. Be Relieved instantly won me over because of the design and ingredient composition. Be Relieved may look small, but it packs a big punch. Be Relieved is formulated with Be Kekoa's own tamanu oil, kukui oil, Roman Chamomile, lemon, tea tree, Vitamin E, and more. It's a powerful blend of healing and soothing relief that nourishes the follicles while leveraging natural antimicrobials and astringents to treat common underlying causes of dry, itchy scalp. My favorite thing about Be Relieved though? The packaging. 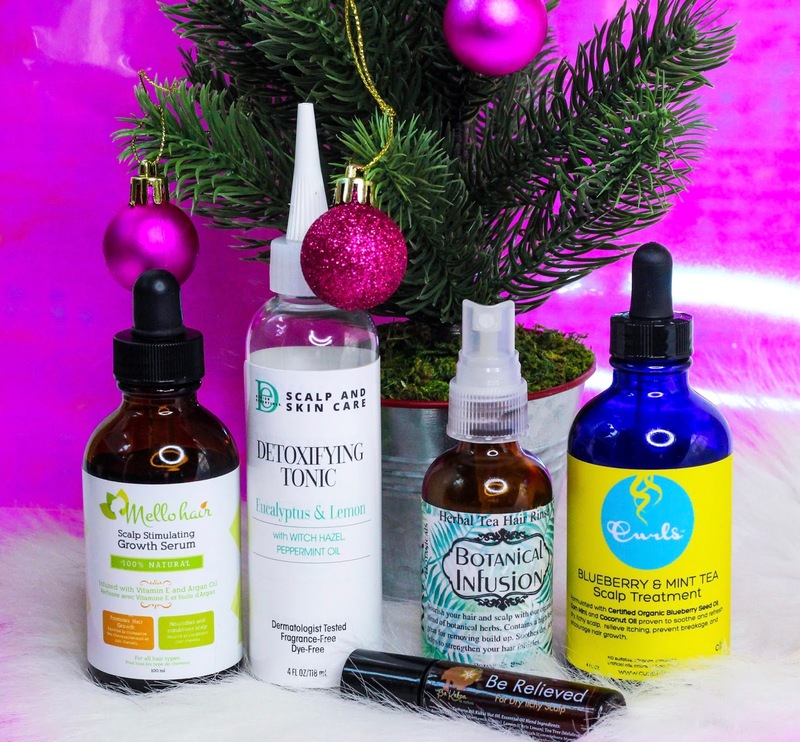 I could immediately tell Brandie and her team put a lot of thought into making Be Relieved something that could work for those of us needing relief. First of all, it's in a small glass vial about the size of the average lipstick tube. Meaning, it fits easily into your purse, gym bag, backpack, back pocket, or glove box. But what REALLY got me hype?! THE STAINLESS STEEL ROLLER! No nozzle tips or droppers here, sis! Be Relieved has a stainless steel roller ball for application. Not like the cheap plastic rollers on the old school lip gloss that always used to get stuck, but a high quality stainless steel roller that not only helps prevent overuse, but feels like HEAVEN. You know that cool, relieving sensation when someone with cold fingers massages your scalp? Imagine having that at your disposal endlessly. That's exactly what Be Relieved feels like. I've raved, and raved, and raaaaaaaaaaaaaaaved aobout the Curls Blueberry Mint & Tea Scalp Treatment. Oh what - you missed that review? Click here to catch up. 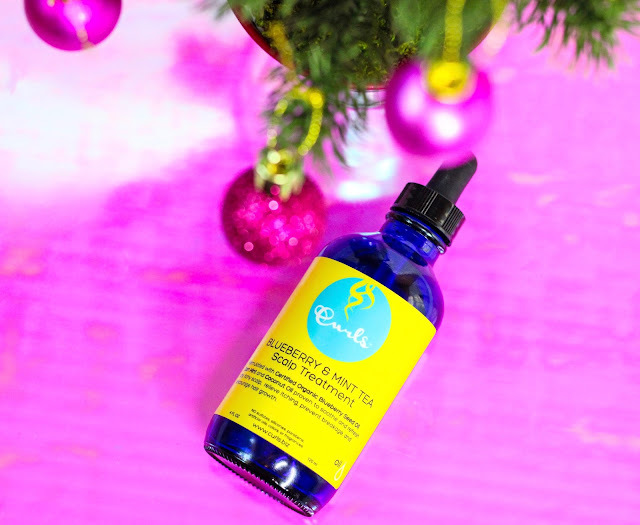 The Curls Blueberry Mint & Tea Scalp Treatment is formulated with organic safflower, soybean, sunflower, and blueberry oils - a combination that is ultra nourishing, high in antioxidants, rich in fatty acids, and really helps lock in moisture on the scalp. But the ingredient I've gone head over heels about? Menthol. And here's why. I call this my scalp crack. Listen, my scalp does a few weird things. I have psoriasis, so it itches between washes. A massage with the Blueberry & Mint Tea Scalp Treatment soothes it SO much. Y'all have NO idea. I read on the googles that some women are using Vicks VapoRub on their scalp to stimulate and encourage growth. I've also read that some psoriasis and eczema sufferers are using Vicks to soothe itching and scalp irritation. And I'm not too ashamed to say that I've tried it for the later reason. But you best believe that ever since I got my hands on the Blueberry & Mint Tea Scalp Treatment, my Vicks (well, Up & Up brand if we're keeping it all the way real) is now relegated only to helping me breathe easy. Because babyyyyyy that Blueberry & Mint Tea Scalp Treatment is the truth. Sometimes, your scalp needs a water-based solution - and that's exactly where Kriya Botanicals' Herbal Tea Hair Rinse comes in. In my feature, I fawned over Kriya's thoughtful inclusion of turmeric into their products. 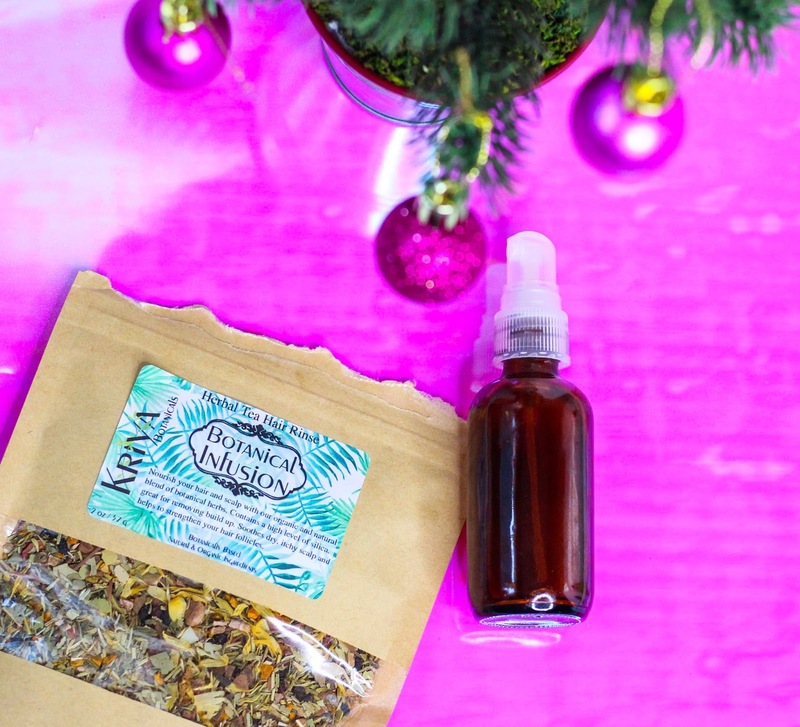 When Claire (Kriya Botanicals founder) learned of my scalp psoriasis, she sent me the Herbal Tea Hair Rinse - a dry leaf botanical infusion of quite literally the best ingredients to treat, stimulate, and nourish the scalp. But after I steeped the hair tea, magic happened. Use this herbal tonic two ways for maximum benefits! Via stovetop, I brough approximately 2oz of water to a boil, and added a spoonful of tea to the water. I immediately cut the flame and stirred until the herbs began to release (like 30 seconds). The fragrance changed from bay leaf to cinnamon spice with a hint of turmeric. No kidding, it smells like a winter spiced tea. I allowed the tea to steep and cool for about 20 minutes, and then strained it into a small amber bottle with spray nozzle. I spritzed the tonic onto an itchy patch of my scalp and you know what happened? Instant relief. No major mega cool tingling, but a soothing, calming relief. That lasted alllll day long. I've also been battling a particularly stubborn psoriasis patch at the front of my hairline. No matter what I do - it reappears 24 hours after wash day, like clockwork. Even after using medicated shampoos. I've been treating my hairline daily with spritzes of the Kriya Botanicals Herbal Tea Hair Rinse, and you know what?! It's getting better. Not miraculously cured, but slowly clearing up. Over the course of about a week, I'm getting more progress than I've had in several months. For anyone dealing with a condition like psoriasis - that's HUGE. Now, this is just how I choose to use the Herbal Tea Hair Rinse. You can brew it up like a traditional tea rinse for wash day - and those instructions are similar, just use more tea and more water. If you're like me and looking for something more day-to-day, steep it spray bottle style and keep it in the fridge for up to two weeks. Either way, you're winning. 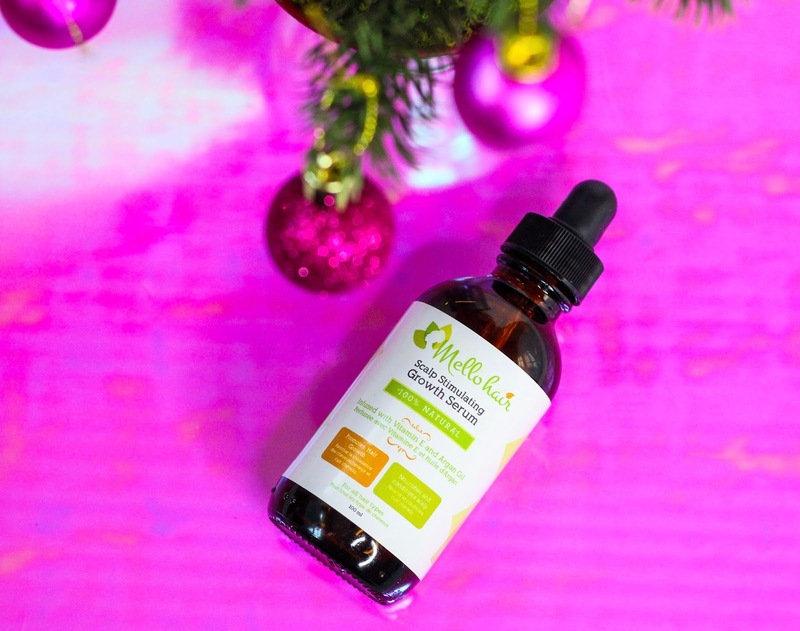 I've become a huuuuuuge fan of Mello Hair's Scalp Stimulating Growth Serum, because it provides amazing relief for something else special that's been going on with my scalp for a while. Dating back to my teenage years - whenever my hair has a growth spurt (noticeably with seasonal changes), my scalp gets really tender. Not inflamed or tension tender, not 'scab hair" tender, and there's no redness, swelling, or signs of infection. But rather, the kind of tenderness where you wanna take an ice cube and run it down your scalp. Have you ever done that on a hot summer day? it's heaven. Growth and relief, all in one! What made me realize that it was growth related was that I could always feel and see the new growth, too. Back in my straight hair days, new growth was easy to spot. I can still see it with my natural hair, but I can feel it more than anything. My hair is weird like that. A few days ago, I had one of those spurts come about, and I needed something fast. Mello Hair's Scalp Stimulating Growth Serum was the closest thing to me, and I went innnnnn. The cooling relief was virtually instant. I got that amazing tingle plus soothing relief on site. The Scalp Stimulating Growth Serum packs enough punch to be effective, without being greasy or weighing the hair down. It's packed with scalp nourishing oils like safflower, castor, flaxseed, avocado, babassu, and hemp - plus peppermint, tea tree, and arrowroot to purify and stimulate the scalp. This one is a newbie! Design Essentials literally just released a Scalp and Skin Care collection earlier this month. And while the new collection contains four different solutions, I'd like to zero in on one in particular - the Detoxifying Tonic. You'll never catch me within 10 feet of a can of dry shampoo. Why? The main ingredient is alcohol. Not the creamy, fatty kind - but the SD 40 kind. The isopropyl kind. The drying kind. That' why when a new wave of scalp cleansing products geared toward protective styling popped up from brands like Cantu, I was intrigued. Carol's Daughter even caught me for a second, then I came back to my senses. I almost laid down coins for the Cantu ACV Root Relief, but then I popped the lid on the ingredient list. Water, Alcohol Denat.... Denatured alcohol? That drying stuff? Oh noooooo..... I immediately changed my mind. Putting alcohol on top of a scalp condition like psoriasis is just asking for problems - and that's where the Detoxifying Tonic comes in. Light years ahead of the competition because it's alcohol free! It's not an oil, but feels more like a serum - and it's completely alcohol free. In fact, it's witch hazel based, which is amazing for soothing inflammation associated with conditions like psoriasis. It's a natural astringent too, which helps remove dirt, oil, and debris. Witch hazel is a part of my everyday skincare routine, so I'm completely comfortable using it on my scalp. The Detoxifying Tonic is clear, virtually odorless, and contains other scalp purifying ingredients like eucalyptus, lemon, and peppermint oil. It also contains glycerin, which is a heaven-sent ingredient to relieve dry scalp. It doesn't require water, shampoo, or rinsing - so it's perfect for refreshing the scalp after working out, or while wearing protective styles. It's also great for folks like me who want to eek another day or two out of their style before washing, but suffer from issues that cause dry scalp and flaking. As we discovered with Be Kekoa, I'm a sucker for a good application method, and I've got to hand it to Design Essentials here. 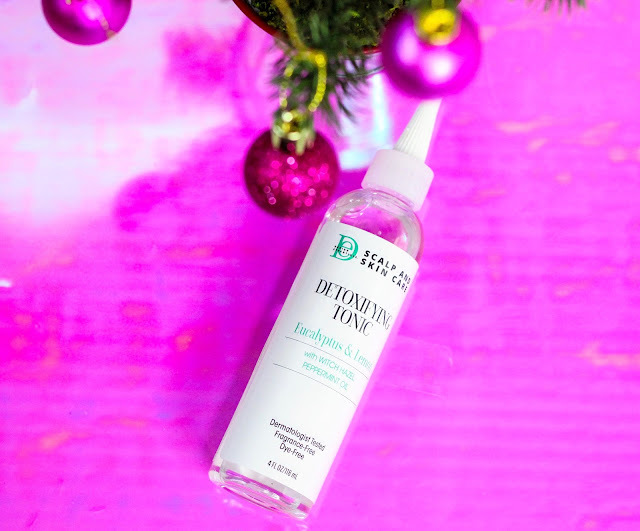 The nozzle tip on the Detoxifying Tonic is super narrow, which helps prevent overuse and makes it easy to target specific areas without serum dripping down your face. Basically, everything about the Detoxifying Tonic is a winner. Interested in learning more about my journey with psoriasis while managing my natural hair? Click here. Oh yeah. How long have I been looking for something similar. I rummaged through the entire Internet for this. My skin is very dry. Therefore, your funds will be extremely useful. Thanks you.